This all-in-one course is ideal for home schoolers from early beginners to advanced students. The curriculum includes concise lessons with short exercises, ear training activities and reviews. Books are available in three separate volumes or as a complete set. Ear training CD's (performed by acoustic instruments) and a Teacher's Answer Key Book are available. Best of all, supporting computer software is now available. This is a fun, interactive way to learn music. No prior musical experience is necessary. Recommended for ages 10 through adult. This all-in-one course is ideal for home schoolers from early beginners to advanced students. The curriculum includes concise lessons with short exercises, ear training activities and reviews. Two ear-training CDs are included, performed by acoustic instruments. A fun, interactive way to learn music. No prior musical experience is necessary. Recommended for ages 10 through adult. 120 pages, softcover. Spiral-bound. This teacher's guide accompanies Alfred's Essentials of Music Theory, Books 1-3. Teacher notes are given with the student exercises reproduced with the correct answers overlaid. 121 indexed pages, softcover, spiral bound. 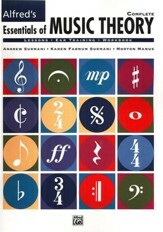 Grade form, glossary, and Ear Training CDs 1 & 2 for Books 1, 2, & 3 included. Music sounds lovely. Playing music sounds lovely. But what's behind the sound? Alfred's Essentials of Music Theory workbook features Books 1, 2, and 3 together in one convenient format, and covers everything from the clefs and note lengths to triads and harmonizing melodies in a minor key. Simple lessons explain the concept, show how it looks written out, and concludes with a few comprehension exercises. Ear-training worksheets are provided, however the music CDs for these lessons are sold-separately. 75 lessons; 125 pages, softcover; spiral-bound. Designed for students of all ages, Alfred's Essentials of Music Theory teachers basic musical understandings of notation, theory and more. Book One covers staffs, notes and pitches; treble and bass clef; note value; time signatures; Dynamics; Flats, Sharps & Naturals and more. Simple instructions gently ease the beginner into comprehending the fundamentals of music. 40 pages, softcover. 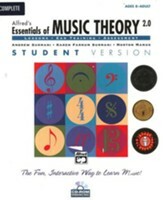 Designed for students of all ages, Alfred's Essentials of Music Theory teachers basic musical understandings of notation, theory and more. Book Two covers the sharp and flat scales; key signatures; the chromatic scale; intervals & The Circle of Fifths; Perfect, Major and Minor intervals; Sixteenth notes; triads, the Dominant 7th Chord and more. Student exercises include identifying notes, transposing music from key to key, completing intervals and more. 80 pages, softcover. The Essentials of Music Theory, Ear Training CD 1 (For Books 1 & 2) may be purchased separately, and is necessary for some of the exercises. Answers may be found in the sold-separately Essentials of Music Theory, Teacher's Answer Key for Books 1-3. Continue working on your music theory with Alfred's Essential of Music Theory Book 3. Picking up at Unit 13/Lesson 51, lessons cover triads, the V7 chord, chord progressions, minor, natural, harmonic, & melodic minor scales; minor triads; primary triads in minor keys; Modes related to both Major and Minor scales; harmonizing a melody in a major key; broken chords and arpeggiated ac companiments, the blues scale; binary and ternary form; and ear training to help recognize these elements when used in music! Reviews are included; 120 pages, softcover. Answers are not given, but are in the sold-separately Essentials of Music Theory Teacher's Answer Key for Books 1-3. 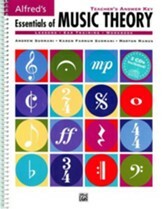 This teacher's guide for Alfred's Essentials of Music Theory contains the answers for lessons and ear training exercises for Essentials of Music Theory, Book 1, Essentials of Music Theory, Book 2 and Essentials of Music Theory, Book 3. Teacher lesson pages are comprised of reproduced student pages with answers overlaid in gray; ear training pages include reduced student pages with examples listed in the margins. Grade form, glossary and index of terms and symbols is included. 122 pages, softcover with wire spiral-binding. Correlating software for the most complete music theory course ever! This all-in-one series includes concise lessons with short exercises, ear-training activities and reviews. Available in three separate volumes or as a complete set, the software includes narration, animated examples and clickable elements for aural reinforcement. Also includes randomized exercises, ear training and review answers. A glossary of all terms and symbols with definitions, pronunciations, and visual and aural examples is also included. 48 Rhythm Flash Cards covering 96 rhythm patterns, organized into 4 progressive sets. This set may be used to supplement any beginning music theory course. Correlates with Essentials of Music Theory, Book 1, and Volume 1 of the CD-ROM. 48 Note Naming Flash Cards covering 96 notes and rests in the treble and bass clefs. Organized into 4 progressive sets. This set may be used to supplement any beginning music theory course. Correlates with "The Essentials of Music Theory" Book 1, and Volume 1 of the CD-ROM. In order to understand music, a student must hear examples of what they are learning. No textbook can fully explain the differences between a whole and half step, a major or minor scale, or a major and dominant 7th chord. 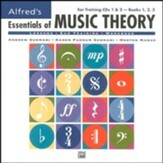 Alfred's Essentials of Music Theory incorporates ear training right in the textbook! Students learn new concepts in concise lessons, practice their music reading and writing skills in the exercises, improve their listening skills with these Ear Training CDs, and test their knowledge with a review that completes each unit. To further develop aural skills, the examples are played by a variety of acoustic instruments (piano, flute, clarinet, alto saxophone, trumpet, trombone, violin and cello). Because each instrument has its own unique tone quality, these CDs will help the music student get accustomed to more than one type of sound.